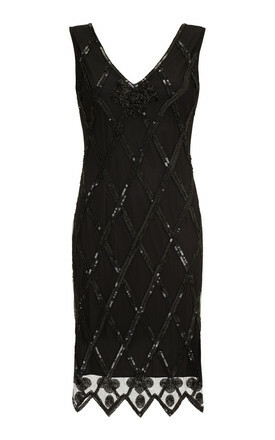 The Limited Edition Liz Flapper Dress is the ideal party dress for all types of occasions. This heavily embellished 1920s style sleeveless flapper with scalloped sequin pattern is to die for; the shiny silver sequins over the Black mesh contrast perfectly, capturing the light and sparkling with every move. The generously fitted flattering shape, and the V-shaped front and back with a floral style beaded tie detail just adds to the vintage loveliness! 1920s dresses are ideal for party season. size UK6 EU34: Bust 32/33" Waist 29/30" Hips 36/37" Length 39"
size UK8 EU36: Bust 33/35" Waist 30/32" Hips 37/39" Length 39"
size UK14 EU42: Bust 39/41" Waist 35/37" Hips 43/45" Length 41"
size UK18 EU46: Bust 43/45" Waist 42/44" Hips 49/51" Length 42"
size UK22 EU50: Bust 47/49" Waist 46/48" Hips 53/55" Length 43"
size UK24 EU52: Bust 49/51" Waist 48/50" Hips 55/57" Length 43"
size UK26 EU54: Bust 51/53" Waist 50/52" Hips 57/59" Length 44"
size UK28 EU56: Bust 53/55" Waist 52/54" Hips 59/61" Length 44"
size UK30 EU58: Bust 55/57" Waist 54/56" Hips 61/63" Length 44"